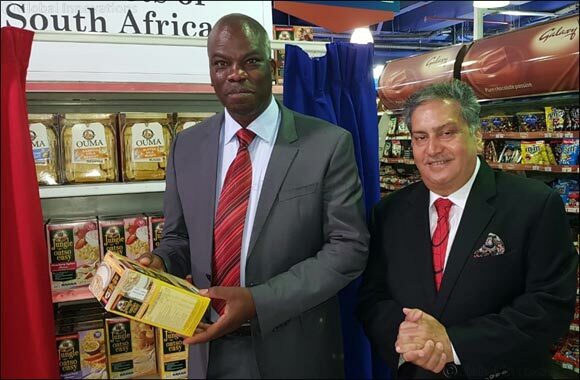 Dubai, UAE, June 21, 2018: Mr. Kamal Vachani, Group Director of Al Maya Group and H.E Mr Mogobo David Magabe, South Africa’s Consul General to Dubai met at Al Maya Group’s flagship Supermarket at Murooj Complex in Dubai. Mr. Kamal Vachani informed the consul general about the FMCG products available at Al Maya Super markets across the UAE coming from South Africa. The Consul General appreciated the Group’s role in promoting South Africa’s food products in the UAE. Brands like Natural Spices, Bakers Biscuits, Vital Soy Sauce, Ouma Rusk, etc. are available at Al Maya Supermarkets, informed Kamal Vachani. Mr Kamal Vachani further added customers are very much happy with the range available in Al Maya Supermarkets. Mr. Kamal Vachani thanked His Excellency for visiting Al Maya Supermarket.